When the first step is wrong, it can lead to a series of mistakes and eventually may get a person into serious trouble. And pride can also can easily bring to the person’s downfall. Sometimes, instead of learning from the mistake, the person may end up plotting for revenge- by blaming others for his misfortune. When faced with situation where we are caught between the avenger and the avengee, instead of running away, perhaps we may try gently to make the avenger see the error of his ways. And that revenge brings nobody any good- it only increases anger- for the avengee may soon become the avenger and when would this cycle ever end? Often, it is not the avengee’s fault- as it may have been circumstancial. The story below illustrates the point quite well…. that hatred is not overcomed by hatred but by love and understanding. In a town, a Red Dragon King who wanted to show his powers of summoning the rains and winds did not adhere to the heavenly instructions in order not to lose a bet with someone. As such, he was to be beheaded for not following instructions. The Red Dragon King begged the king there to help him- as the king’s assistant is also the heavenly officer who was supposed to be beheading the Red Dragon King at a fixed time and date. The kind did his best to distract his assistant to continue to play chess with him so that the assistant will not travel up to the heavens to behead the Red Dragon King. The assistant pretended to fall asleep and beheaded the Dragon King in his dream. The Dragon King was very angry with the king and wanted to come and seek revenge- he blamed the king for not keeping to his end of the bargain when in fact, the king had really try his best. His spirit came to disturb the king. The king knew his life was in mortal danger and went to seek help from the abbot in a monastery. The abbot promised to king that he would do a special prayer to help to protect the king. The abbot’s close disciple and attendant was Tang Sanzang. 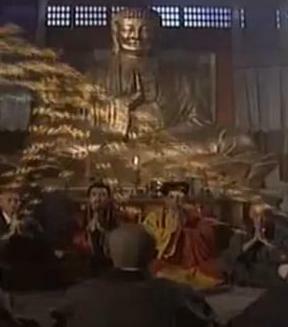 Tang Sanzang respectfully checked with his teacher- why can’t they do prayers to release the Red Dragon’s soul from suffering instead of just doing protection chant? The abbot said the spirit was angry and to pray and transfer merits to release his soul would not work. 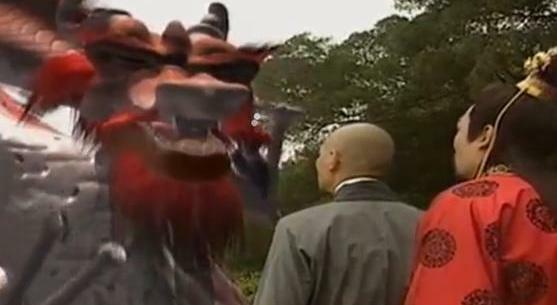 That day, the protective prayers was done but it was no match to the angry spirit of the Red Dragon King. He sought out the king for revenge and was chasing them- Tang Sanzang held on and protected the king- standing between the dragon and the king. In the end, Tang Sanzang explained to the Red Dragon King that the misfortune he had was something he bought upon himself. He taught the spirit that there was no use of having hatred and attachment of wrong views. The spirit obeyed and surrendered to his reasoning. Tang Sanzang promised the Red Dragon king that he would chant the Heart Sutra for him to release him from suffering as soon as possible. 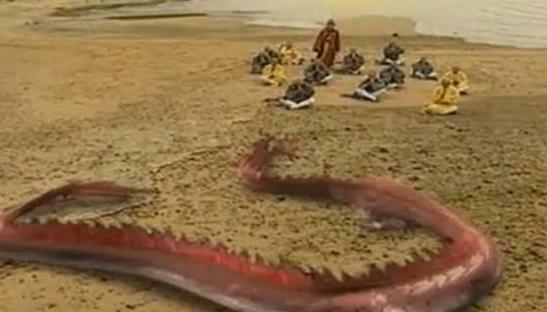 The Dragon spirit was grateful and gave up on revenge. The king was very grateful to Tang Sanzang and offered him senior advisory position. But he declined because he said he had a dream- in his dream, Guan Yin came to him to request him to go to West (India) to obtain the sutras back to China.